fout> _gblok.vraag > onjuiste vraag: select label from tek_artikelen where url="xymantix_followup"
Just in case one little person out there that did not read your prior interview and has no idea who you are, lets begin there, could you share some personal information about yourself first? such as your real name, what part of the Globe you reside on etc. I find it very rare that you are not only a programmer but a skinner and wallpaper designer too! What came first? Designing skins, playing around with graphic programs and making wallpapers or wanting to develop software? Xymantix: I learned the BASIC programming language back in high school, which makes it a whopping 15 years ago. Correct me if I'm wrong, but that's way before the dawn of skinning! So I guess I've been programming for ages but have only been skinning for about two and a half years. POV-Ray (a freeware raytracing program) allowed me to easily bridge the gap between programming and graphics, since I'm not very talented artistically in several areas. For instance, I'm lousy at drawing or sketching, but on the other side of the coin a lot times it's pretty easy for me to figure out how to create a particular graphic or effect by telling a computer program how to draw it. That probably explains why I enjoyed the more “technical” skinning programs, like Sonique and Litestep, which were among my first. Tek: I'm also aware that you are currently employed as an Engineering Supervisor for a computer language software developement company? What computer language exactly is this? Xymantix: The company is BASIS International, and our main product for several years was called BBx, which stands for Business Basic Extended. That means that it's a derivative of the BASIC computer language with all sorts of extensions and enhancements for financial and business applications. It's actually quite popular, even though you've probably never heard of the language or the company before. There are more than 1.7 million end users using various applications coded in BBx, from banking and accounting software to car dealerships and healthcare. During the past few years we've rewritten the whole language from the ground up in Java. Tek: sounds interesting and no you're right I have never heard of BBx, I'm surprised. So do you also create skins and/or graphics for this company you work for? Xymantix: I was actually able to do that a while ago. Since the new version of our language is written in Java, we were able to take advantage of a freeware product called SkinLF that allows you to skin java-based applications. The BBj skin that I made is shown on the main page of the SkinLF site — take a look at this here, and click on the themepack image for a fullsize screenshot. They even quoted me on the site — a couple paragraphs down I'd like to do more, but “real” work always gets in the way! Xymantix: I've only done that one skin for it so far. But, it is the default and gets shipped with the product, so that's kind of fun. Xymantix: One of these days I'll see if I can port it to Windowblinds, It's a KDE and GTK+ theme. Tek: Yes that would definetly make for a great windowblind. Xymantix: I've been in the community since about the middle of 2000. I can't quite remember how it all started, but I recall a friend at work downloading NextStart and showing off his cool desktop. 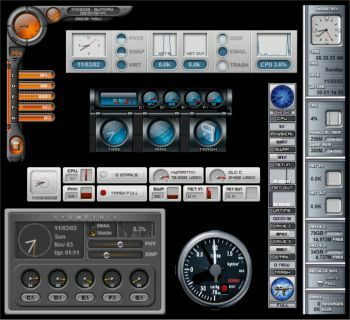 Later that day I had NS installed and had downloaded several dozen themes from Customize. My first “serious” skin was for CMX-5000 for Sonique It's actually not bad at all, and I still really like it. In fact, I eventually ported it to CoolPlayer then to QCD Player since my music player of choice has changed over time. 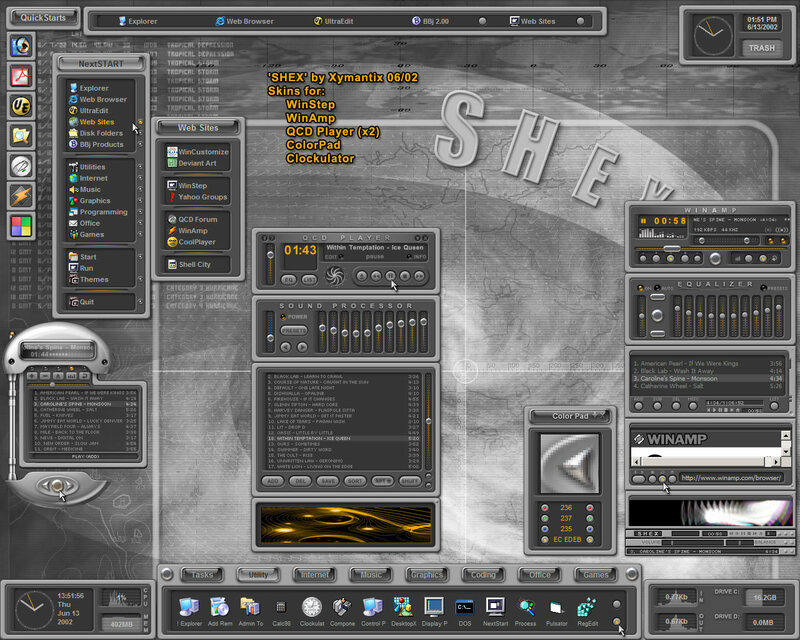 Probably my first “non serious” skin was a Winamp skin that I eventually gave up on. It's much cheesier than the Sonique skin! I'd show you that one too, but I can't find it anymore. Tek: so you never finished that Winamp skin you quitter? Tek: Do you remember the first site you rolled in on and which site or sites are you pretty much settled into these days now? Xymantix: Definitely Customize for the first site. After that went away, I moved on to Skinz.org. But I was never active in the community at that time, though. Tek: why not? you never hit the msg boards for help me questions? Xymantix: No, it's just that at that point in time all I did was download skins It wasn't until later when I started making them too that I really got into the whole thing No, I just read and reread the skinning specs and reverse-engineered existing skins, which I still do today! I started to become more active after Wincustomize showed up. Now my top three are Wincustomize, Skinbase, and deviantART. They are all very different, so I get a very good mix of all things skinning from the three. I also go to Deskmod and Artuproar a lot to round things out. Xymantix: Hmmm, probably to take a course in it so that the initial concepts are thoroughly covered. It's much easier to start off a little more slowly but have a solid foundation than it is to go too fast and suffer later on. Tek: so courses over books? Xymantix: Books would be ok, as long as you have the discipline to finish them. I usually don't so I know how that can be. Tek: me either I buy the self tutoring books but I get to page 3 and quit. I've always wondered which is the better to start with Visual Basic or C++ and why? Although, if you were looking to get into programming more for fun and enjoyment instead of a career, VB is a good place to start since you can make so much progress so quickly. I guess that can be a curse too though, because a lot of times people get so carried away with “wizards” and such that they never really learn some of the more fundamental theories behind programming. where do you get your ideas for developing & designing programs from? do they come from your artistic side or the technical programming side of you? Xymantix: Usually from wanting something done. You know the old saying about necessity being the mother of invention I usually write utility type programs — things that automate repetitive tasks or make my life easier in one way or another. Tek: and then you what? look at them and say oh dear that baby needs some skin?! Xymantix: Ha Ha! Actually, I've only written one skinnable program. What programs have you written and could you tell us alittle bit about them and what they do? Xymantix: I've mostly written a boatload of handy little utilities. It wasn't until recently with SysMetrix that I actually “finished” one. I can be a bit of a perfectionist, so most programs were never finished or released because they weren't polished enough or didn't do everything that I eventually wanted them to do. SysMetrix, my first publicly available program, is a system metering utility. The only other program that I've released is Xtail, which is modeled after the Unix tail command and gives you real-time views of changing files. Tek: hmm what is it with you men, always wanting to monitor things with gauges and stuff? Xymantix: I'm a stats junkie, I need to know at all times what it's doing. If it's acting slow, I want visual confirmation by seeing high CPU/memory usage, etc. Tek: And where does a programmer go after they write these programs to get them out to the public? Xymantix: I guess it depends on whether you want to sell them or give them away! I write these kinds of programs for fun, and am not really interested in charging money for them. Because of that, the choice is pretty easy. One way would be to release them under the GPL and make the source code available someplace like SourceForge. If you're not into the OpenSource thing, you could just allow people to download the programs from your website, which is the route I've taken. Xymantix: Yeah, you kind of have to be part salesperson if you want the word to get out. so what would be your dream program that you have not written yet but would like to in the future? Xymantix: That's a tough one. It used to be a program like SysMetrix, but now I only dream about small enhancements. I'm going to have to start setting my sights higher I guess. Tek: What do you enjoy more, the programming or the skinning and artist side of you? Xymantix: Both, just not at the same time! I go in streaks where I won't skin for weeks, and only code. Then I'll switch and only skin and not code at all. But If I were really forced to pick one, it would probably be the graphics side. It's usually less tedious and more experimental and fun. Tek: Doing just one of these as a hobby would be time consuming enough, how do you find the time to do both? Xymantix: It's only fun once you know enough about it to do something neat and useful with it With all of the things going on, I actually have very little time for either one. Luckily I've been doing them long enough so that in general if I have an idea of where I want to go I can get there without spending too much time on it. In other words, I'm fast! Just so you don't get the wrong impression, though, there are some skins that have been languishing for months due to lack of inspiration. So, once the fires die down, I can be incredibly slow. Tek: don't you wonder how long it takes Treetog? he seems to whip them skins out like it's a peice of cake. Xymantix: Yeah, it would be a blast to see how others do it. I've downloaded some of Dangeruss's .PSD files and he does his stuff completely differently than I do and It's a good learning experience to see how others work. Xymantix: They should make some “Skinning in Photoshop” videos they'd sell a bundle! Tek: That's not a bad idea… well what programs do you actually use for making your art with? Xymantix: I use Photoshop for just about everything. Occasionally I'll use a raytracing program like POV-Ray for a wallpaper, but now I generally spice it up in Photoshop afterwards. For each skin I'll have a Photoshop “source” file that's full of a zillion layers. I've learned over time to never throw anything away — you're guaranteed to want it sometime later. especially when the program is complex enough like Photoshop. Tek: And I've also seen some impressive stuff come out of Paint Shop Pro too, guess it has alot to do with the person sitting behind the program driving it? Xymantix: Yes, they are just tools after all. In the hands of someone competent they can produce amazing things. Xymantix: In addition to who I mentioned last time, I'd add Hippy. It's mind boggling to see all of the incredible stuff he's done — tons of Windowblinds skins too. Xymantix: He's very prolific, and all of the work is unique and high quality, I don't know how those guys come up with such good ideas constantly — must be nice. Xymantix: Yeah, I was surprised by how many good entries he had for the GUI olympics, If that were me, I'd have to stockpile Windowblinds skins up for 3 years! Tek: hehe okay now the dreaded Tek question “Do you remember your first skin?” and would you be willing to share that with us? Xymantix: Yup — it's the CMX-5000 from above. You can still see that and my second and third skin by searching for the artist “Double” on the Sonique site. I started out as Double (get it — double decker? ), but switched to Xymantix because double was already taken everywhere I went. I needed something more uncommon — so I made something up! Tek: so your other nick was Double? Tek: Okay and now to patch up any possible embarassment of showing your first skin (Which looks pretty cool to me btw) What skins have you made recently that you are most proud of? and would you be willing to brag and show us those? Xymantix: It would either be the Graduate suite which is my most recent or perhaps Shex which was the previous one. Xymantix: Nothing I make is really astounding or intricate, but I think they are really usable. I can use them for months without getting tired of them, which in the long run is the most important aspect to me. Tek: yes some of the designs on those media apps are sheer hide and seek! Tek: hehe yeah and by the time you figure it out, you've lost your mood for tunes! Xymantix: haha and that's the nice thing about making your own — it makes sense to you! As both a programmer and a skinner what are your thoughts on the skinning community as a whole? I mean where it began and where it seems to be heading? Xymantix: It's probably going to keep on getting really popular, then the pendulum will swing and it will die down to a more reasonable level. Skinning is also popular in other areas too, though. Tek: Well I definetly see it rising in the pocket pc arena now that is for sure, but what exactly are you talking about? Tek: oh yeah even people skinning their pc box etc and even adding neon lighting inside a designer box, though I always think to myself why would I want to get that when my box is hidden in my desk in a cabinet? Xymantix: Mines on top of my desk so the kids don't climb under the desk and turn it off, but yeah my PC is skinned too! Aluminum case, see-though panels, neon lighting — you name it! Tek: well Nick I guess I took up enough of your time, again I want to say “Thank you so much!” I really appreciate it, specially since we cornered you two times! Tek: Thank you that's really nice to hear since we try but can't do it without people like you sharing your time!